Today, the Senate Energy and Natural Resources Committee held a hearing on “The Future of Natural Gas.” There were no partisan or ideological fireworks. The expert witnesses were Howard Gruenspecht (U.S. Energy Information Administration), Ernest Moniz (MIT), and George Blitz (Dow Chemical). Moniz argued the environmental risks associated with natural gas were “challenging but manageable.” Blitz sounded a note of caution. Industry uses natural gas both as a feedstock and as a manufacturing fuel. Policy-driven increases in natural gas demand due to, for example, a Clean Energy Standard, EPA’s Utility MACT Rule, or tax incentives for natural gas vehicles could do what high gas prices did in the early 2000s — close factories and offshore jobs. I may blog on their testimonies later on. Gruenspecht’s testimony provides a valuable primer on natural gas production, demand, reserves, and trends. This post excerpts some of the key facts and figures he presented. Production. After a decade of stagnation, U. S. natural gas production increased by almost 17 percent between 2006 and 2010, reaching 21.6 trillion cubic feet (Tcf) in 2010, the highest level since 1973. Production has continued to increase despite a significant and sustained decline in natural gas prices since mid-2008. The growth in U.S. supplies over the past few years is largely the result of increases in production from shale gas formations. Shale gas production grew from less than 3 billion cubic feet per day (bcf/d), representing 5 percent of overall production in 2006, to 13 bcf/d, accounting for 23 percent of overall production in 2010. Imports. Increased domestic production has greatly diminished the Nation’s need for natural gas imports, while lower prices have reduced foreign producers’ incentive to supply the United States. In 2010, net imports to the United States dropped to 2.6 Tcf, representing 10.8 percent of U.S. consumption, marking the lowest volume of net imports since 1994 and the lowest percentage since 1992. As recently as 2007, net imports were the highest on record, equaling roughly 16 percent of consumption. Demand. Natural gas provides about 25 percent of the primary energy used in the United States, heating about half of U.S. homes, generating almost one-fourth of U.S. electricity, and providing an important fuel and feedstock for industry. About 31 percent of the natural gas consumed in 2010 was used for electric power generation, 33 percent for industrial purposes, and 34 percent in residential and commercial buildings. Only a small portion is used in the transportation sector, predominately at pipeline compressor stations, although some is used for vehicles. Reserves and Resources. U.S. total natural gas proved reserves [resources that can be extracted economically] grew 11 percent in 2009 and are now at the highest level since 1971. Shale gas proved reserves grew 76 percent after having grown by 48 percent in 2008, reflecting continued strong drilling activity even as natural gas prices declined from their mid-2008 level. Production Growth to 2035. In EIA’s Reference case projection, which assumes no changes in public policy, total natural gas production grows by 26 percent, from 21.0 to 26.3 Tcf, between 2009 and 2035, due primarily to significant increases in shale gas production, which comprises about 47 percent of U.S. dry gas production by 2035. Production increases faster than demand resulting in net imports declining to below five percent of consumption by 2023. Price Projections to 2035. In EIA’s Reference case projections, natural gas production costs and prices are expected to rise over time as production shifts away from the most attractive “sweet spots” to less productive areas. Average annual wholesale natural gas prices remain under $5 per million Btu (all prices are in real 2009 dollars) through about 2020, increasing to higher levels thereafter. Oil prices, which were typically 1 to 1.5 times higher than natural gas prices on an energy equivalent basis during the 1995 to 2005 period, are now over 3 times higher than natural gas prices. In EIA’s AEO 2011 Reference case projection, the ratio of oil-to-natural gas prices remains above 3 on an annual average basis, as the balance of gas supply and demand within North America limits natural gas price increases at a time when the world supply-demand balance for oil is expected to push oil prices up at a faster rate. Demand outlook to 2035. 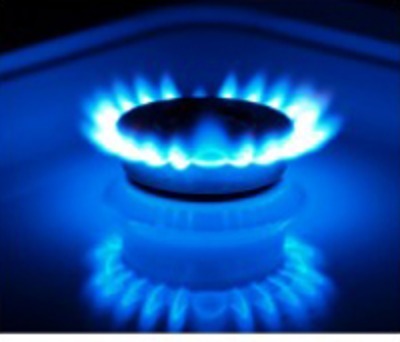 Demand for natural gas in the Reference case grows by over 16 percent between 2009 and 2035. Consumption growth is driven by the industrial and electric generation sectors. Natural gas use in the industrial sector grows by 25 percent from 2009 to 2035, reflecting the recovery in industrial output and relatively low natural gas prices, which spurs a large increase in natural gas consumption for combined heat and power (CHP) generation more than offsetting the decline in natural gas use for feedstock. Electric generation also shows strong growth in natural gas use, where 65 percent of capacity additions between 2010 and 2035 are expected to be natural gas fired. In addition to capital cost considerations, uncertainty about future limits on greenhouse gas emissions and other possible environmental regulations reduce the competitiveness of coal-fired plants.